Since I ran across the folks from Mad Cave Studios at Wizard World Chicago back in 2016, they haven’t stopped pushing forward. Everyone involved has seemed pretty determined to make Mad Cave Studios “the little publisher that could,” and the momentum they’ve gained has led to some pretty significant changes for all involved. Never too busy to take a minute to talk about his love-child, however, Mark London, the Big Brain behind many of the Mad Cave’s titles, sent out a feeler to see if thePullbox would be interested in an interview. Always happy to chat with such an enthusiastic comicbook creator, I agreed. thePullbox: It couldn’t have been an easy job, getting to where you are now. There are many independent publishers out there working toward the security provided by success and recognition. How have you kept the motivation up, both personally and as an indie publisher? Mark London: I get a lot of encouragement from my wife and kids. It’s a real privilege to have the family supporting this Mad House. But also the team at Mad Cave has become a pillar to lean on, the artists, the designers, the MKT/sales team, the Editor in Chief and editors. 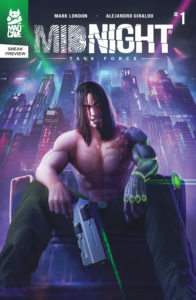 From the start, most of us knew what we were getting ourselves into, and we’ve tried to maintain that spark of creating worlds, designing characters, and bringing a company to life so we could entertain anyone who’s reading. We are a tight-knit group, and if we see someone drifting away, we do everything we can to get them back into the fold. Sure, there were times we underestimated the process and encountered some big obstacles, but we kept on going because we’ve never forgotten what we set out to do: Make beautiful and engaging comics. thePullbox: So some big changes for you guys recently… Would you like to be the one to break the good news to anyone not already aware? Mark London: Ha, yes! The cat is literally out of the bag. Mad Cave Studios has partnered with Diamond Distribution, and now you can find Mad Cave comics in comic book shops across the country. We are here to stay. PB: How does being included in Diamond’s Previews World affect Mad Cave Studios and their titles? PB: Regarding the “relaunch” of many of your main titles, and assuming that getting into Previews World played a part in the decision, were there any other factors considered; mistakes or missteps that you wanted to undo; new directions or ideas to take advantage of? Mark: Some might say that there is no right or wrong way to make comics, but in reality, there is. And there are the rules you painfully learn as you go through the learning process. So, yeah, too many missteps to talk about in this interview, but that’s how you get better at something, right? I’m a firm believer that you learn more from your mistakes than from your achievements. Of course, the idea is to improve on those and never make them again. And if they do happen, just keep pushing forward and never look back. PB: You’ve already relaunched Mad Cave’s flagship title “Battle Cats”… written by you, I believe, and a very cool title from the start, in concept and visual style. 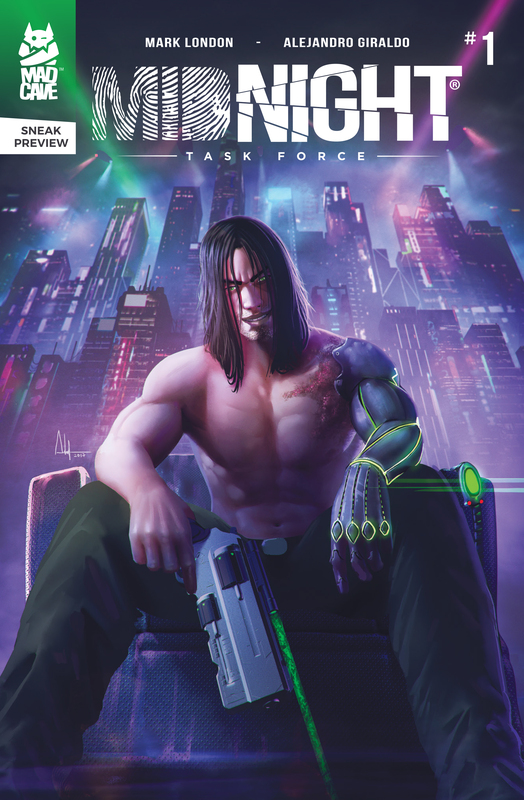 Next up is your cyber-thriller “Midnight Task Force,” which you also wrote. What can you tell us about this title? PB: What’s the next benchmark you’re shooting for? 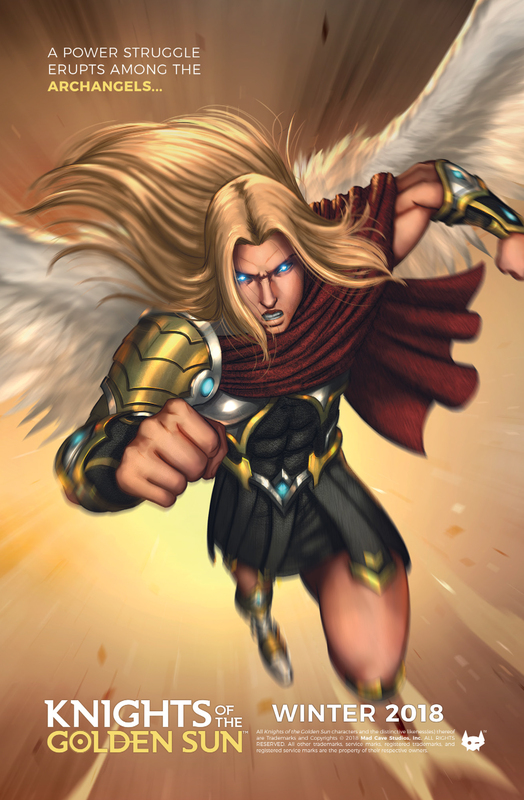 Mark: Next stop is Knights of the Golden Sun which we plan on releasing in November, and for 2019 we have a very aggressive plan which involves six new titles and the continuation of our flagship Battlecats. Those titles are, Honor and Curse, Legends of Wolvenhart, RV9, Nuke Lands, and two others that are in the pipeline. Mark: HAHA, I agree with you, Mifune’s the only one that can pull it off. Okay, but just between us, Honor and Curse is a title we’ve been working on for a long time. It was supposed to come out with Midnight Task Force. But as we’ve already been over this, Honor and Curse was one of the titles where we learned a lot and when we finished that first issue I was not happy with the result. It was not a book that we (as a team) could call a Mad Cave book. So, I decided to redo the whole thing with a new team that we are announcing very soon, but I’m confident it was the right call. Man, you guys are in for a treat. The art is fantastic and plays well with the overall concept of what this story should be. 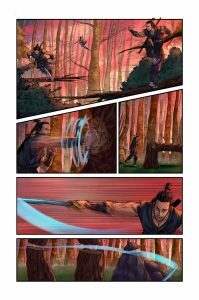 Set in feudal Japan, its an action-adventure (martial arts inspired) story, that follows a young shinobi by the name of Genshi Sakagura who’s troubled by a dark spirit and must find a way to come to terms with what he really is. A tragedy in his past haunts him as he questions what his ancestry is all about, while he struggles to fit into his clan- who not only sees him as an outsider, but also a menace. His doubts begin to manifest supernaturally, and he’s going to have a hard time controlling this spirit so he doesn’t lose himself in the darkness. While mixing elements of horror with traditional Japanese mythology, this story has action, drama, and conflict. And considering the growing popularity of manga and anime in the west. 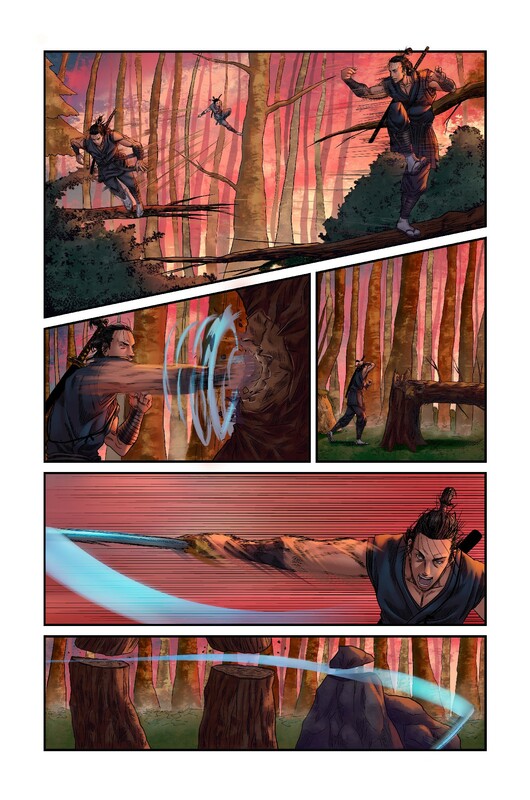 we believe Honor and Curse will attract fans of Naruto, Ninja Scroll, and Usagi Yojimbo. 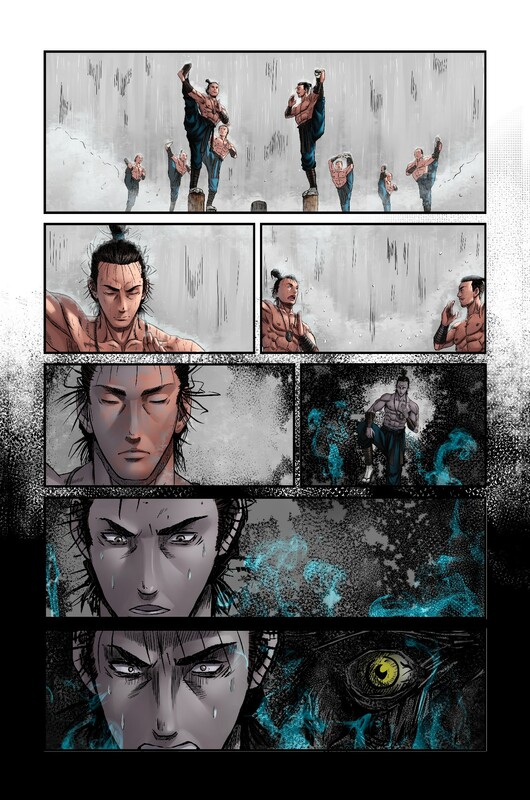 The scenes with the spirit are impactful, and we have a strong lead character in Genshi that has a lot to overcome. The aspects of drama, love, and war are present and always looming. It’s very emotional, but people will have a blast. 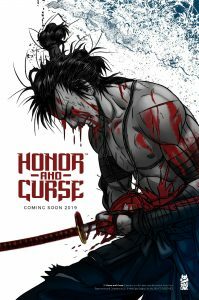 Honor and Curse will be available early next year (2019). PB: From the way it looked when Mad Cave Studios first opened their doors, you were the creative mind behind the books. You wrote Battle Cats and Midnight Task Force… Have I missed any credits we need to add your name to? Mark: Well, I’m currently writing six of those titles I just mentioned, but we’re getting more writers into the mix since we’re planning something big with some of these characters. And as you know, I’m also running this circus. PB: Where many writers will stick to a particular or favorite genre, your titles cover a pretty broad range… epic fantasy, cyberpunk, mythology. As they’re all stemming from one source- namely you- I have to ask where it all comes from? What’s the inspiration you’d credit for your ideas? Mark: I grew up in the 80’s, and I like to think that was a helluva time to be exposed to emerging types of media: Comics, video games, movies, animation, literature; I devoured everything I could get my hands on. Put all that into a blender, and I guess that’s where you’ll find where I draw my inspiration from. I guess this is why I like to explore so many different themes and genres that might seem opposites or extremes but complement each other when done well. PB: Okay, here’s a piece of existentialism for the college crowd. If we follow the line of thought from “I think. Therefore I am” to “I create, therefore I…” How would you, Mark London of Mad Cave Studios, finish that particular sentence? Mark: Very interesting question, I love it. This would be my take. PB: Last question for you, Mark, cuz I don’t think these comics are out there writing themselves and you sound like a man with a plan. Is there one tiny piece of story, something that’s buzzing around the back of your head and keeping you awake at night begging to get out? Can we maybe get just a taste? An elevator pitch for thePullbox crowd? Mark: Uff, and probably my team is going to kill me, but what the hell. We have big crossover ideas coming between Midnight Task Force, RV9, and another book that is in the works. That’s all I can say for now. 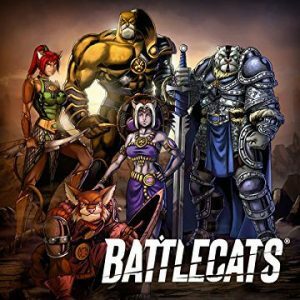 If you were so inclined, you can check out thePullbox reviews for a couple of the titles mentioned, including the original releases of Battlecats and Midnight Task Force… They may still be covering the original release of the books, and keeping in mind that there are changes afoot, it’ll give some idea of what’s coming down the pipe.